This report sets out a series of recommendations to reform the private hospital sector in England following the Ian Paterson scandal, which left over 500 hundred women who underwent unnecessary breast surgery in two private hospitals maimed and injured. Based on an extensive review of CQC inspection reports of 177 private hospitals in England, this report provides evidence which identifies the characteristics of the private hospital business model which make it susceptible to exploitation by ill-meaning or incompetent surgeons. The refusal by private hospital companies to accept full responsibility for what happens in their facilities means that patients will always be at risk. Or, put another way, there can be no guarantee of patient safety in private hospitals without full liability. 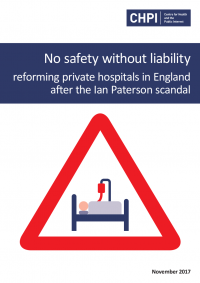 The report makes five recommendations to reform the private hospital model in order to make them truly safe for patients and to avoid a repetition of the Ian Paterson case.